By sending this booking your details will only be sent to Fifty Five Bar and Lounge and will never be shared with other third parties. By clicking this box you agree to the Terms and Conditions set out above. You can book to reserve an area of Fifty Five Bar and Lounge for you and your friends. Just enter your requirements below to see what they have to offer. 13 bistro tables and 52 chairs all under heated awnings and high sidings to provide an intimate outsite drinking area. What did you think of Fifty Five Bar and Lounge? Great bar. Recently stopped in when I was in Camden on business and ended up staying all night! Found the staff and customers really friendly and easy going. No complaints at all and will be back next time I'm in Camden. Brilliant. If you like your bars unpretentious and fun then Fifty Five Bar and Lounge is for you. There are musical pleasures so guilty they should be in prison, as well as decently priced drinks and a lot of fun people. If you're not stuck up - head to Fifty Five Bar and Lounge - it's a lot of fun. Best party bar in Camden by miles! Love it at Fiftyfive - so many cocktails to choose from and it's always absolutely buzzing! Sublime cocktails + great tunes = great night out. This place rocks!!! I've been coming to Fifty Five since I moved to Camden last year. My friends and I have now decided to try each one of the amazing cocktails on their menu - quite a challenge! The food menu is great and really delicious. Also very useful for balancing out the cocktails...! The atmosphere is always really buzzy - great staff and music. And it always attracts a good crowd. I would recommend booking a table if you're planning a weekend visit as it gets very busy for Happy Hour. Love it! Lovely cocktails but pig ignorant bar staff. Waited over half an hour to be served with bar man looking beyond me and serving people behind me who had not been waiting anywhere near as long, as though I was invisible. VERY rude. Decor is average. My friends and I have just discovered Fifty Five and we find it a great place to go. The atmosphere is enjoyable with a great music collection. I am rather picky with what I drink but there are so many cocktails everyone is happy! I find it amazing that the staff there can remember all the different drink recipes, and are always so friendly and professional. Definitely somewhere we will be going more often! I have been going to Fifty Five for many years now and my love of the venue has not changed much. The menu is full to the brim of amazing cocktails to suit everyone (and I have taken many friends to the venue). The cocktails themselves are executed brilliantly by some talented individuals who really know what they are doing more importantly all the bar staff seem to love what they do and have a great time doing it. The new members of staff still have a little catching up to do with the old school crew, but I am sure this will happen over some time. Now with the addition of food at the venue it has really added a new edge to the bar. I have only sampled a few bits of the menu so far, but so far so good. With the food has come bigger tables which has made life a lot easier especially during happy hours where it is 2-4-1 for TWO WHOLE HOURS. Over all I would definitely recommend going to this bar if you are anywhere near the Camden area. If you are going as a group and are wanting to stay for a while I would say book a table especially on a Friday or Saturday night, as it seems very rare that all the tables are not already booked. This becomes very apparent during the happy hour when the bar is at its busiest. Fifty Five Bar has a wide range of delicious cocktails. (all are amazing by the way) Its a great place to gather your mates on a night out try out the extensive cocktail menu and listen to the rocking tunes playing from the speakers. The staff are really friendly and and service is pretty fast considering how packed this place gets. I have been there many times and always enjoy my night. Fifty Five is my most favourite place to go. This cocktail bar is fantastic. I have been coming to this bar for years. The staff are always friendly, the cocktails delicious and it has a fantastic 2-4-1 2 hours even on a Saturday night. My regard for the bar increased in December when we booked an area for a big birthday party. The booking process was easy and everyone was very helpful before the event, but throughout it they were even better. They took delivery and protected a giant birthday cake from other customers! The bar was really buys, particularly during their Happy Hours, but the barmen were always friendly and patient and their cocktails were as fabulous as ever. On top of that, they had just started their food menu and I can definitely recommend the pulled-pork sandwich and fifty five burger. Thanks Fifty Five Bar for another great night. Top notch stuff here. Visited on a recommendation from a friendly barman at Graffiti Bar near home and was not disappointed. Atmosphere was infectious and the cocktails made very quickly to a high standard. The only downside was that it took some time to get served, but considering how busy the bar was, the staff coped extremely well. Easily the best bar in Camden. I booked a table on a Saturday Night for my birthday, and had the time of my life! The atmosphere in the bar was pure party, the music was awesome. The range and quality of the drinks was outstanding. For me the highlight was the excellent service from our barman, despite being under huge pressure behind the busy bar, he made an effort to talk to us, learn our names, recommend and talk us through the science behind the perfect drinks he was creating, and all the while clearly enjoying himself as much as we were. I would definitely recommend this bar to anyone! Go there, you wont regret it! I haven't been to every cocktail bar in London, but if I had I'm sure this would be one of the top. Amazing range of cocktails, at a price to make you smile, especially at happy hour. Try the ice cream cocktails! Absolutely delicious. Anyone who comes here for a vodka coke is a fool, there are so many more interesting drinks on the menu, for every taste. Downside to visiting such a great bar, it's usually busy so don't be surprised if you have to wait at the bar or for seats. The staff are very friendly (well always have been to me) and very conscientious. Whenever I am asked by friends visiting London where they should go I always say 55 Bar. It always amazes me the quality of drinks these guys make under such pressure, with such an extensive menu. Happy Hour does get busy but the drinks are really worth waiting for. My group of friends and I go quite a lot and we always have a good night - there is always a buzzy atmosphere, partly down to the bar team clearly having a good time! Also, not sure about the comment below about the drinks being pricey. They seem pretty reasonable given the quality and in comparison to other less enjoyable, pretentious venues I've been to! Looking forward to enjoying some more summer evenings sitting outside, enjoying a cocktail or two! Although the cocktails were good, the atmosphere was a bit bland and the layout of the bar was pretty awkward. But the thing that annoyed me was the fact that the bar staff were more interested in doing Jagerbombs than serving me. Stood at the bar like a lemon - a lemon not invited to a private party. One drink and we left. But....will give it the benefit of the doubt and try another night as I have heard good things. at one minute to 6 when the 2 for 1 started, I was told I couldnt order the cocktails and pay when the tills changed over. As much as the bartenders think they're amazing I doubt they can bust out a decent cocktail in a minute. Nice bar, massive menu, massive ego. Went to 55 Bar on a Saturday night and had a great time. Expected it to be bigger but guess size makes it quite cosy, and it does get busy. Happy hour between 6-8, as you would expect, had the bar rammed but worth the wait definitely. Amazed at number of cocktails available, all quality. But more amazing were the guys behind the bar...several customers at once and several cocktails at a time. Those guys work hard for the money. Outside happy hour the drinks are a bit pricey but its an experience. Music is indie/rock and maybe a bit loud. Booking an area is strongly recommended for groups. Friendly crowd and my one main bit of advice would be....have a bit of patience and enjoy!! I went to Fifty Five for the first time the other weekend for a friend's birthday. We had reserved an area, which was great as the bar was super busy - if you're in a group I recommend you do this! We all had the best time and (from what our photos showed!) were all singing and dancing by the end of the evening. We drank delicious cocktails all night long and the staff ensured my friend's birthday was one to remember. As I said, this is the first time I've been to Fifty Five but from my experience I had no complaints at all (I never even had to queue for the toilets!). I would recommend this bar to anyone wanting a really good night out, with good cocktails and great music. I won't need someone's birthday as an excuse to return! Hi, my name is Stuart and I'm the owner of Fifty Five.I'm really gutted that you had a bad experience. I don't want to get into an online argument but I find it hard to believe your comments. The bar has just undergone a complete refurbishment, including brand new toilets for both men and women! The bar and toilets still smell of paint and varnish a month on! Happy Hour is very busy as we are giving away free drinks for 2 hours, we also try our best to keep everyone happy. I'm disappointed you felt your drinks were made without passion. If we can make it up to you in any way, please get in contact. the drinks in happy hour are knocked out with so little passion. bar Fifty five is one of those places you must visit at least once in your life! From the moment you walk though the doors/gateway into the welcoming atmosphere and great music. You are then mesmerised and fascinated by the huge array of exotic and intriguing bottles. Then upon arrival to the bar you are welcomed by a friendly and cheerful member of staff and the extensive and exciting cocktail list and the fabulous 2-4-1 happy hour. 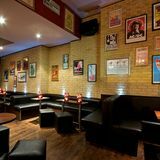 Bar Fifty Five has the same atmosphere 7 days a week and is finally a place in London that serves great drinks, plays amazing music, full of friendly people without a inch of pompous snobbery in sight! I love Fifty-Five. Fact. It's everything I've been searching London for and previously failed to find. It's totally unpretentious, serving great cocktails (the 2-4-1 deal makes them soooo reasonable) to a killer soundtrack. The service is brilliant: the staff are really friendly and are geared up to make everyone's night all about the fun! I would highly recommend! Recently started a job in camden and went out for drinks with my colleagues on tuesday, we went to 55 and a few drinks and a quiet one soon turned into taking full advantage of happy hour and then 2pound tuesday, getting home far too late for a 'school night' and not feeling too fresh in the morning! dont regret a thing though, brilliant cocktails expertly mixed by bar tenders who really know their stuff, great friendly atmosphere and not an overly expensive night out either! looks like it could be my new tuesday thing to do! Had an amazing night for my birthday on Saturday. So many drinks to choose from everyone was kept happy! Felt like we almost had the place to ourselves as we were upstairs away from the main bar. Shame they didn't serve food as that would have given it the final star. definitely go there again. Staff were friendly and happy hour was fun. I lived in Camden for a couple of years from 2000-2002 and never found a decent bar to spend time in. Recently returned for a night out and discovered bar 55 - wish it had been there when I lived in the area. I went first on a Saturday -it was comfortable, with seating if you were speedy and a bit of dancing as the night went on. The music was good for all tastes and everyone was friendly and unpretentious but the cocktails were the standard you'd pay £15 for in the centre of town. Have since been back in the week and was quieter but kept the atmosphere and loved the happy hour! Relaxed and good-quality bars are rare and I'm difficult to please if it's not a pub but Bar 55 seems to have cracked it! if you're after pure unadultarated fun without any pretention, queues or hefty bar bills then this is your place - High Five!! I have been to this bar a few times and can easily say it's fantastic. The staff are professional and always remember your name. Since the short time they have been open they are quickly growing into a great London venue. Outside, it offers an area for smokers and non smokers alike with its Continental feel, awnings and bistro tables, enclosed by sidings. The main bar is a massive party with fantastic music choices. While upstairs, in the Live Lounge you can sit back and watch live blues five nights a week, still enjoying the same quality cocktails from their extensive menu. Catch the happy hour from 6-8pm every day which is 2-4-1 on all of their 160 cocktails and you're onto a winner! Fifty Five is a rare place - this bar has something to please everyone without failing. From the pages of mouthwatering cocktails on the menu mixed to perfection by the friendly and knowledgeable bartenders, to the range of beers on offer, the drinks alone can't fail to satisfy. 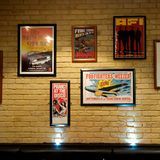 However, Fifty Five has another trick up its sleeve; while the main bar rocks to classic tunes, the upstairs bar has been opened as a live Blues venue. Friends who consider themselves Blues aficianados have been raving about it and are more than prepared to travel from South London on a regular basis. Fifty Five is not just a great place - it is THE place. Fifty Five is a rare treat - all your cocktail needs in the main bar, accompanied by tunes to really get the party started while a live Blues venue has recently opened upstairs. If this still doesn't please you - stay in Wetherspoons. Fifty Five Bar is awesome! It plays top tunes and has such a great atmosphere. The barmen are gorgeous and really interactive, they can do all the tricks in the book when making cocktails, of which they serve loads. I would recommend it to anyone, probably one of the best bars ive been to for a long time. Fifty Five Bar and Lounge proves that a good cocktail bar doesn’t have to be pretentious and overpriced to deliver quality mixology. Just be prepared for the huge selection. 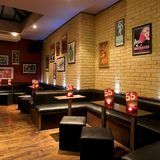 A short walk from Camden Town station, just off the main high street on Jamestown Road, Fifty Five Bar and Lounge is really easy to find. Once inside, you'll be taken aback by the relaxed feel of the place. If it's winter, the burgundy walls offer a cosiness often missing in cocktail bars and in the summer the large glass windows flood the place in light, so you don't feel cooped up. The laid-back ambience is further emphasised by the black leather sofas and seating with low tables. There's funky artwork, mirrors on the walls and pretty chandelier-style lampshades. The bar is set across two main levels with a third floor in the basement. Be warned though, ladies – if you're in massive heels the stairs can be quite steep and it's a balancing act to get up and down them, especially if you've knocked back a few cocktails. Unlike other 'hip' bars in the surrounding area, it really doesn't matter what you're wearing at Fifty Five Bar and Lounge. It's really relaxed here and appeals to everyone from twentysomething Camden caners to smartly-dressed after workers. The staff are friendly and extremely well trained - they look as if they're enjoying the night as much as the punters who've come in for a drink. The music policy here fits in with the modern Camden scene and sways away from ubiquitous cheesy commercial music - you're more likely to hear The Friendly Fires as opposed to Britney. There's no live DJ but the bar has a long play list with hundreds of electro, indie and rock tunes expertly chosen by the bar staff to heighten the party atmosphere - here, the bar staff are the DJs. You'll be amazed by the sheer volume of cocktails on offer at Fifty Five Bar and Lounge. There are around 180 cocktails on a menu that’s changed annually. All of the drinks are reasonably priced, too. You can expect to pay £5-£7 for cocktails and the bar has great 2-4-1 deals Monday to Saturday from 6pm-8pm or all day Sunday, and 2-4-1 mojitos all night on Mondays. If you're after a tequila-based favourite but fancy something with a twist, it's definitely worth trying Tommy's Margarita (£6.30). This San Francisco born short drink tastes strongly of alcohol although it’s not overpowering. Whereas a regular margarita contains Triple Sec, Tommy’s Margarita utilises Arette Blanco mixed with organic agave syrup and freshly squeezed lime juice, which gives the drink a sweet kick without being too sickly. If you're after something more fruity and sweeter, it's worth trying a Raspberry Collins (Russian Standard vodka, raspberry puree, raspberry liqueur and lemon juice sweetened with sugar and topped with soda; £6.30). Whilst the lemon juice gives it a nice twist, the raspberry is the strongest flavour and it nicely muddles the generous serving of vodka. If you prefer something sharper, try the Hemingway Daiquiri (rum, fresh grapefruit juice, lime and cherry juice; £7). Although fresh grapefruit juice is an acquired taste and might be too sharp for some, it nicely complements the rum and is well balanced by the cherry juice. If you're not a fan of cocktails then there is a wine list containing seven whites, seven reds and two roses. Prices start at around £3.70 for a glass of Italian Pinot Grigio del Veneto. There's also a selection of Champagne from £32 a bottle. 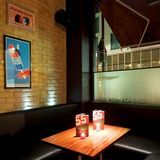 Great staff, delicious cocktails and a laid back atmosphere – Fifty Five Bar and Lounge delivers on all counts.